Of all the types of plywood available on the market, CDX grade plywood is the most commonly available in lumberyards and building centers. This softwood plywood is the least expensive grade of multi-layered veneer plywood, manufactured in small factories around the country for local use, predominantly in construction. CDX plywood is manufactured, like other types of softwood plywood, of opposing layers of wood veneers, laid at right angles to each other and glued together with resinous glue. There are always an odd number of layers, balancing the sheet, to prevent warping of the panels. Actually, the odd number of veneer layers allow for an even number of glue layers. An odd number of glue layers would cause the glue to pull towards one direction, causing warping of the panel. The letters “CDX” refer to the grade of plywood panel. Most plywood is graded based upon the finish of the exterior layers, specifically the amount and type of defects that are allowed in these layers. A Face veneer is practically free from all defects. Smooth, paintable surface. Limited number of patches. B Solid, more knots than A grade, possible minor splits. C Limited splits, discoloration or sanding defects that don’t affect the plywood’s strength. C plugged As its name implies, the splits and defects have been plugged. D Unplugged knots and knotholes up to 3 inches, splits and other defects allowed. Although available, it is rare to find plywood where both sides are the same grade. This is essentially limited to hardwood plywood that is used for cabinetmaking. Most plywood is graded with two letters, showing the face and reverse side grading of the plywood. Based upon this grading system, we can see that CDX plywood has one side that is “C” grade and one that is “D” grade. The “C” graded side is the face side, used where it is more visible, and the “D” graded side is the reverse side, usually mounted in a way that hides it. The difference between interior and exterior plywood is in the resin glue which is used to hold the various layers of veneer together. Exterior grade plywood, marked with an “X” after the surface grade uses a resin that is more water resistant than interior grade plywood. It can also mean “Exposure grade 1” which stands for damp-proof plywood used for demanding environments such as underlayments and roof sheeting. “CDX” plywood is an exterior grade plywood only when considering the adhesive used for connecting the plys, since the wood isn’t waterproof. As the most common plywood product available on the market, CDX plywood is available in a number of thicknesses, ranging from 1/4 to 1-1/4 inch thick and also including 3/8, 1/2, 5/8 and 3/4 inch thicknesses. Please note that these are nominal thicknesses. The actual thickness of these plywood sheets will be 1/32 inch less than the nominal size, due to finish sanding of the sheet. CDX plywood is often utilized as roof sheathing or for exterior walls due to its water resistance. CDX plywood sheets exposed to the elements can withstand exposure to rain or high moisture conditions without compromising structural integrity. This plywood type does absorb water—slightly expanding in the process— so it’s not waterproof, but it also dries quickly as well— and once dry it goes back to its original size. This resistance to weather and dimensional stability after exposure is the primary reason to choose CDX over the more economical OSB (Oriented Strand Board). OSB panels delaminate and swell when exposed to the elements and don’t go back to their original shape after it dries. OSB panels used as roofing sheathing exposed to rain or snow can give the subsequent shingles an unattractive wavy appearance. That said, CDX plywood isn’t immune to the slings and arrows of Mother Nature indefinitely. Repeated or prolonged exposure to rain (or ice and snow) will eventually compromise the integrity of this material. 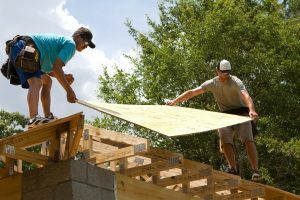 If you’re in the middle of a project and a summer thunderstorm drenches your roof sheathing or the walls of the garage you’re erecting, relax…your project will be fine. If you’re in the middle of a project and winter sets in…that’s another matter altogether. You might want to give any exposed CDX plywood some protection, especially for exposed roof sheathing. Even roof felt would be enough to (likely) protect it until the weather warms up. CDX is often utilized as the subfloor for kitchens and bathrooms— especially for floors destined to be finished with ceramic tiles. When placed across equally spaced beams, joists or rafters, CDX is almost 10% stronger than OSB, often utilized as a subfloor due to its economy. This additional strength really helps when using CDX plywood as subfloors. This added strength means less bowing/flexing in the subfloor. That bowing/flexing could then lead to the separation of the adhesive from the tile or crack the tile altogether. When it comes to choosing a subfloor for a ceramic tile floor: choose CDX plywood over OSB— it’s stronger and doesn’t have the problems with moisture that OSB does. CDX plywood sheets are also available in fire retardant sheets, though those sheets come with a much heftier price tag. These are often used in commercial building applications to meet with construction code regulations for fire suppression and/or safety concerns. As long as appearance isn’t a concern, using CDX plywood to build smaller projects shouldn’t be a problem. Let’s face it, C’s and D’s weren’t good grades in school, and they aren’t good grades in terms of plywood appearance. Neither side of CDX plywood will win any beauty pageants as they’re both pretty much ugly as sin. But if you need to construct a series of shelves in a garage or workshop area, CDX plywood is a good economical choice. It takes glues and adhesives well (better than OSB due to the waxes involved with OSB manufacturing) as well as fasteners like screws and nails. If you want to build shelving using CDX, however, make sure to support longer shelves, as CDX will eventually sag slightly in the middle if put until a constant heavy load. Conclusion: CDX plywood isn’t the prettiest thing you’ll ever see, but it’s the right choice for many construction applications.